A handful of organic kale. Unfortunately, healthy as it is, conventionally grown kale often has pesticide residues. If this is all you can find, soak it in hot water with a splash of vinegar first. Ideally though, organic is best. 2 kiwi fruit. Scooping out the fruit from the skin with a teaspoon is much quicker than trying to pare the skin off with a knife. Enough ‘milk’ of your choice to reach two thirds as high as the ingredients in your blender. I much prefer this new Milkadamia over conventional cow’s milk with it’s hormones, antibiotics and gas causing lactose. A couple of ice cubes if you’d like it cold. 1 cup of diced papaya for many more health nutrients, along with proteolytic enzymes for digestive health. 3 tablespoons of fresh flaxseed meal increases the already high fiber content in this smoothie and adds essential omega-3 and estrogen controlling lignans. 1 cup of chopped pineapple gives extra antioxidants, vitamins and digestive enzymes. A good blender will handle the pineapple core so make sure you add it as it contains the most bromelain. 3 tablespoons of raw pumpkin seeds for more vitamins and minerals, along with phytosterols and special DHT inhibiting nutrients. If you enjoy making and drinking smoothies, it makes sense to get a good blender. I’ve had them in the past and found cheap blenders are false economy. Ice or any harder ingredients quickly wears them out and they seldom blend leafy greens like kale very well. The difference, once I got this brilliant high powered blender, was amazing. Ice, nuts, seeds and other harder ingredients are all blended up instantly. Even tougher greens like parsley stems are pureed and drunk down with all the nutrients released from the fiber. To quickly make this refreshing avocado and kale smoothie, first push down the handful of kale close to the blades of your blender. Next add your banana and yogurt. Top it off with the avocado, kiwi fruit and ice. 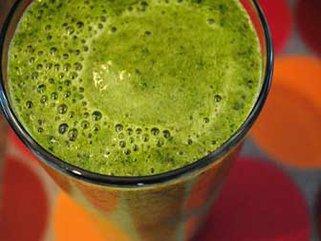 Blend it all up until the green smoothie is smooth and creamy. This recipe has a generous helping of vitamin C to help prevent oxidation, but it’s still best to enjoy it as soon as you finish blending. If you find it too much to drink all at once you can freeze the remainder for a delicious and healthy frozen shake for another time. I’d appreciate hearing what you think of this avocado, kiwi, banana and kale smoothie and any other variations that you’ve tried. It’s a simple way and enjoyable way to get a lot of nutrition into your diet. There’s more smoothies and other great tasting recipes using very health foods in the Superfood Recipes section. This recipe looks delicious…just as a side note: most papaya you should buy organic as well. This is because most of the papaya you will find in the grocery store is genetically modified from Hawaii. That was delicious, thank you! Thanks Lori for the positive comments. Thanks Christina. Look for the larger Caribbean or Mexican red papayas as these are not genetically modified. There’s more papaya to eat in them too. Here’s a tip on how to keep handy the leafy greens like kale, spinach, parsley and such without spoiling: I blend up my greens in the blender with some good filtered water, as much as it requires (start slow) add as u go. Then pour this mixture into ice cube trays. After frozen, remove and keep frozen in ziplock bags. When you get out your blender to make smoothies, no matter what kind, you can add a few to half a dozen cubes to get your greens with no trouble. Hi Jacque and thanks for your helpful comments. I have been caught with extra greens in the past and this is a useful tip. This was so good! Thanks for the recipe. I don’t have yoghurt so I used 1 cup of coconut milk instead. Also I used frozen banana and pineapple rather than ice cubes as I freeze most of my fruit for smoothies. It was such a thick combination I ate it with a spoon – yum! Hi Tam. That’s sounds good. Glad you liked it. Glad you liked it Sukey. I am new to the smoothie movement. Thanks for these great tips! Is it always necesssry to add yogurt or milk? I personally think half coconut milk, half water is much better. Some liquid is needed unless it is a very water rich fruit like watermelon being used. I also like to use half water and half almond milk. I also think it needs more protein if you work out, so I add a scoop of protein powder. Thanks for the recipe!